The following results are representative of the types of cases we handle; results in any particular case will vary. The verdicts, judgments, and settlements are before deduction for attorneys' fees and expenses. Medical malpractice wrongful death case against South Florida physician on behalf of mother and father of 15-year-old boy who died needlessly when the attending doctor refused to consult with a team of expert doctors. The doctor's negligence included refusing to assist in the boy's transfer to the University of Miami; proceeding with a surgical procedure without discussing the risks with the mother; and administering sedatives which caused the boy's oxygen to crash to dangerously low levels indicating severe respiratory distress and eventual cardiac arrest. Dr. Marante and his insurance carrier fought accepting accountability for this tragic incident for more than 4 years. (Photo: Mike Lyons/First Coast News) Read full article. Wrongful death claim in this crash involving a tractor-trailer, two vehicles, and a school bus in Jacksonville, Florida. Medical malpractice wrongful death case against South Florida hospital and surgeon who botched an elective laparoscopic hiatal hernia operation. Surgeon perforated Mr. Palleiko's esophagus during a difficult surgery and failed to detect the perforations before completing the surgery. An HCA Hospital failed to monitor his deteriorating condition in recovery. Mr. Palleiko developed gastric sepsis, suffered kidney failure, and ultimately passed away after numerous operations, over many months of pain and suffering by Mr. Palleiko and his family. The negligence claims included failure to recognize Mr. Palleiko was not an appropriate candidate for the operation, failure to convert to an open surgery, failure to respond to the patient's deteriorating condition, and failure to diagnose and treat perforations in the esophagus. Rubin & Rubin forced the Hospital and their insurance company to settle before trial. Medical malpractice case against a West Palm Beach orthopedic surgeon on behalf of a police officer when a drill bit broke off during a hip surgery operation, and was lost in the surgical opening. The physician was aware of the "surgical complication" and chose to close the incision with the drill bit fragment still inside Ms. Larson. The surgeon and the hospital then told the patient and her husband the surgery went fine. They failed to disclose the complication which became known to Ms. Larson only when she was looking at her own x-rays in a follow-up appointment. The orthopedic surgeon tried to escape this claim by having Ms. Larson sign an arbitration agreement hidden in the initial patient paperwork on the intake clipboard. Rubin & Rubin lawyers invalidated the arbitration papers and then forced the Hospital and the surgeon to settle before trial. Florida Statute 766.102(3)(b) provides for a foreign body presumption of negligence. For more information on this issue, see the Florida Supreme Court opinion Dockswell et al v. Bethesda Memorial Hospital, Inc.
Medical malpractice emergency room claim. Mrs. Carmody's bowel obstruction was ignored by emergency room physicians and staff despite a clear radiology report showing the blockage. Mrs. Carmody was released and suffered a burst colon at home. She was forced to have emergency surgery to save her life. The emergency surgery caused extensive scarring, cardiac complications and PTSD. Rubin & Rubin forced the Hospital and their insurance company to settle before trial. Custodial negligence case against mental health facility. In the hospital children's unit, a male patient was found sexually assaulting an 8-year-old child patient in her bed. Indian River County jury found the hospital breached its duty of care to protect the female child because there were inadequate safety rules and no precautions taken to detect or prevent patient-on-patient violence. 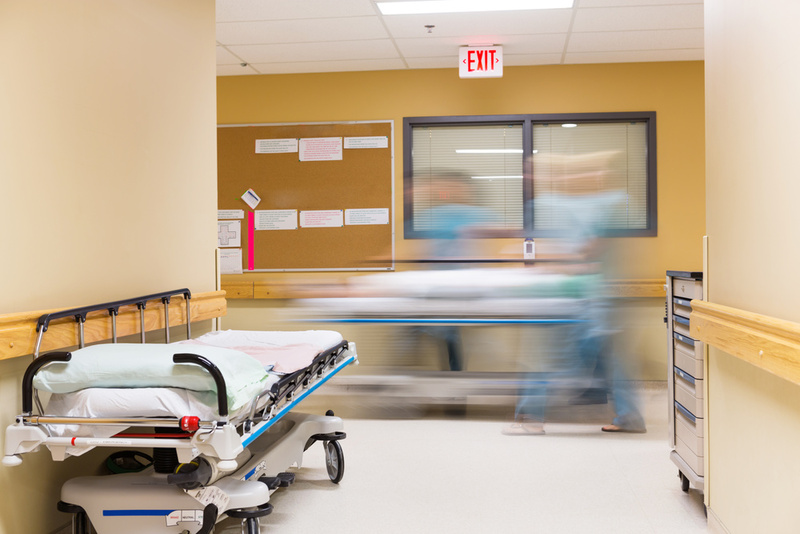 Complex medical malpractice emergency room claim on behalf of catastrophically injured client who suffered a traumatic brain injury as a result of the delayed diagnosis of a hemorrhagic stroke. Man recovering from back surgery was not monitored properly by hospital nurses causing partial paralysis and lifetime permanent injuries. Mr. and Mrs. Bernstein lost their security business as a result of the incident. Settled after sixth day of trial. Woman in her 60's in the hospital's rehab center post- hip surgery was left unattended after physical therapist instructed her to try challenging exercises using improper equipment. Mrs. McCusker fell after her hip and arm failed, hitting the back of her head on the floor. Subdural hematoma resulted in mild brain damage and permanent swallowing disorder. Settlement just before trial. Still born baby medical malpractice claim on behalf of the parents as a result of an alleged failure to timely deliver an expectant mother's baby against the instructions of the patient's perinatologist. After a family barbecue with relatives in a small historically black town outside Tallahassee, The McCloud Family was stopped by police at 2 a.m. on a dark, remote road as they were returning to their home in West Palm Beach. The all white officers separated this African-American family by locking the mother, father, son and daughter in separate squad cars. After bringing in drug dogs and finding nothing except birthday gifts and left-over barbecue in the trunk, the officers had the 15-year-old daughter strip searched in plain view on the side of the road and then forcibly took the family back to the relatives' home, where the officers forced their way into the home, dragging an elderly relative out of bed. No drugs were ever found. The family was released without even an apology. Rubin & Rubin tried this high profile case before a federal jury in Tallahassee. Negligence and cruel and unusual punishment - Child in private wilderness program for juvenile delinquency was suffocated by his instructor who ignored rules and regulations regarding proper circumstances and methods for restraint. Case settled for over $1 million before trial including scholarships for underprivileged boys in Mikey's name. Wrongful death and civil rights case arose when St. Lucie County Sheriff’s deputies at the county jail placed a detainee overdosing on drugs in a restraint chair. The officers at the jail ridiculed the detainee who plead for help and medical assistance and the jail nurse provided help only after it was too late. Multi-million confidential settlement. Vero Beach businessman was wrongfully arrested by Indian River County Sheriff's Deputy Michael Cavanaugh for felony child neglect. Kovaleski's civil rights were violated by Cavanaugh who barged into his home without a warrant or probable cause for an arrest, handcuffed Mr. Kovaleski in front of his very young children, then falsified an arrest affidavit and provided false testimony in court to justify the arrest. Little did the deputy know, Kovaleski had home video surveillance showing Cavanaugh lied. This federal civil rights case settled for $500,000 before trial. Wrongful death and civil rights case against the City of Miami based upon a police officer’s shooting of an unarmed motorcyclist. This case gained national notoriety because the officer’s actions started riots in Miami’s Overtown area. The Plaintiffs settled the claims before trial. Cruel and Unusual brutality led to death and serious injuries at Florida State Prison. Rubin & Rubin fought The State of Florida and its vast resources for nearly ten years, including three appeals, proving that the Warden of Florida's most notorious prison permitted goon squads of prison guards to inflict their own punishment on inmates. This case was covered by the media nationally including CNN, The New York Times, Miami Herald and St. Pete Times. Case settled after the warden was sent to federal prison. A fire at a rental home without smoke detectors resulted in the tragic deaths of a beautiful and bright 7-year-old girl and her father who was overcome by smoke trying to save her. Settlement with owner and real estate company that managed the rental home. Wrongful death and multiple permanent injuries in this automobile head on collision in the Florida Keys. This case was settled before trial. Wrongful death drunk driving case against minor, parents of another minor who served alcohol during an open house party and liquor store that sold alcohol to minors including separate bad faith lawsuit concerning the claim of the liquor store against its own insurance company for failure to procure liquor sale liability coverage. Wrongful death claim on behalf of surviving mother of a 14-year-old child involved in an ATV accident against the owners and operators of a race track. Successful Appeals in Fourth District Court of Appeal and Florida Supreme Court concerning releases involving minors. Ultimately led to the 2010 passage of a statute regarding the validity of releases signed by parents and guardians. Driver of an automobile turned into the path of Mr. Garcia's motorcycle in the dark hours before sunrise as Mr. Garcia was on his way to work as an aviation engineering supervisor. The negligent operator of the car was underinsured, but Rubin & Rubin was able to force him to pay a confidential amount in excess of his State Farm insurance coverage before trial. Wrongful death claim on behalf of surviving daughter of suicidal Baker Act patient with history of fainting spells who facility placed in a small "tub room" for more than 45 minutes without checking on her. New Horizons had no policies advising its own employees how long patients should be in room by themselves or how often to check on them, and no way to monitor their well-being. Wrongful death claim on behalf of the three surviving children of Marchman Act patient who eloped dual detoxification and mental health stabilization facility and was killed by a drunk driver on a nearby roadway. New Horizons had no policies on communicating with police after patients left facility without permission and its employees failed to take any steps to try to save Mrs. Scoleri. Complex wrongful death medical malpractice claim against hospital and radiologist on behalf of the six surviving minor children of a patient who suffered a traumatic brain injury and death as a result of an alleged failure to properly read a diagnostic test, leading to the premature discharge of an unstable patient from the hospital. Federal Torts Claim Act medical malpractice wrongful death case against a VA Medical Center for perforation of superior vena cava causing patient to bleed to death during routine medical procedure. Lumber falling off a flatbed truck then striking a car traveling behind it resulted in injuries to a pregnant woman causing the premature birth of her son with cerebral palsy. Case was settled just before trial. Young driver was texting while driving resulting in no braking, rear-end vehicle impact with client's SUV, which was stopped at a red traffic light in Port St. Lucie, Florida. Rubin & Rubin client, a retired businessman from New York City, suffered a traumatic head injury, including inter-cranial bleeding (hemorrhage), which months later caused seizures. Our client was fortunate to have ample Uninsured/Under Insured Motorist Coverage. The case was settled with client's own UM carrier just before a federal trial. This is a fine example of why Florida drivers should always elect to accept as much UM coverage as they can afford -- this is a protection Florida requires insurance companies to offer to insureds, and is one of the few insurance benefits for the driver and their family's benefit and protection that prevents financial devastation if you are hit by a driver without insurance or with little insurance. Libel and Slander case where Rubin & Rubin represented Suzanne Akerley, a public high-school employee who was falsely accused of theft and contributing to the delinquency of minors. Ms. Akerley was the subject of headline articles in local newspapers and on local news broadcasts when she was arrested after the false charges were leveled by a disgruntled student and her mother. Ms. Akerley lost her job, while she and her family were disgraced in the community. The charges were dropped by the Sheriff's office, but Suzanne's life was shattered. A St. Lucie County jury awarded $500,000 in damages in Suzanne's favor. The presiding judge awarded over $500,000 more in attorney's fees. The insurance company insuring the defendants offered only $25,000 before the trial began. Rubin & Rubin qualified over 800 clients to receive fair share of trust fund set aside by Philip Morris in the famous Engle Smokers Class action. Jacksonville cemetery practices claim for tortious interference with a dead body. Confidential settlement first day of trial. Jacksonville cemetery practices claim for tortious interference with a dead body. Cemetery lost remains of mother of Rubin & Rubin client through negligence and poor record keeping. After many inquiries the pastor of the church operating Restlawn insulted Mrs. Gardner causing stress, heart palpitations and aggravation of medical conditions.